When your child has a fall, you pick them up and although you cannot take the pain away, it does give their little body time to feel it will be alright. Our children get older, grow up and then their falls are bigger but we still hold them and most times that is enough. Later in life they have their own children and a new cycle of love and caring is started. The trouble is that when they fall they have to be strong for their children, that is when I still want to hold them. No matter their age they are still your children. We have just had one demented fanatic, drive his car into people on the Westminster bridge. He then went on to try and get into the Houses of Parliament. We are a tolerant society, maybe too tolerant and these fanatics are slowly pushing us to a point when we may become irrational. The question that we should ask is what price should we pay to make it clear to these fanatics that their policies are unacceptable? Then the question must be, what price, we are going to pay, to make them understand that we will no longer accept the violence. Through their constant desire for killing and oppressing anyone who does not agree with them, we have had to add security measures to travel, to name just one of many. These small things are gradually adding up and when the irritation box gets too full we will react. How to solve the problem might be relatively simple, but at the moment, the political will is not there, yet. The Formula One seasons starts in Melbourne this weekend and if you are hoping to see a change in the order of racing, I believe you will be disappointed. Mercedes, I hope, will not reign supreme. The gladiator days of Mansell, Senna and Prost, surpassed by technology. As the days are getting longer and warmer we lose an hour tomorrow, daylight saving. I will miss that hour for a day or two and then forget it was ever there. Above a glimpse of what I deal with on a daily basis when it comes to communicating with my family. Robert is in San Francisco with Angela in Sydney. 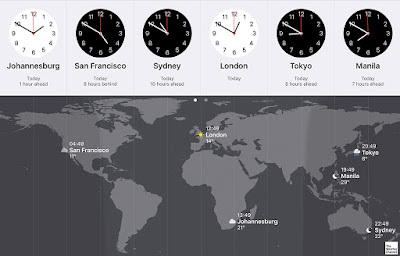 That time zone photo is awesome! Interesting result from the first F1 race, didn't manage to watch the race from here so can't comment on the levels of excitement!